Jim Ross/NASA via Getty ImagesA test of a hypersonic aircraft. General John E. Hyten, the Commander of US Strategic Command, admitted that the US has no real defences against hypersonic weapons that are being “aggressively” pursued by China and Russia. The only defence against such weapons, Hyten said on Tuesday, is the threat of a US nuclear response. The general said he wanted more investment in radar stations and space infrastructure that can detect any of these weapons, but even that is challenging because of threats to US space dominance, how hypersonic missiles function, and a lack of resources. US Air Force General John E. Hyten, the Commander of US Strategic Command, made a worrying admission on Tuesday about the state of US defences against hypersonic weapons: They don’t really exist. While hypersonic weapons are still largely in either the conceptual or testing phase, Russia and China have been making headway on their respective programs. China tested a functional hypersonic glide vehicle (HGV) in November 2017, and Russian tested a hypersonic weapon only a few weeks after President Vladimir Putin boasted that he has an “invincible” hypersonic missile in early March. “We don’t have any defence that could deny the employment of such a weapon against us,” Hyten said. 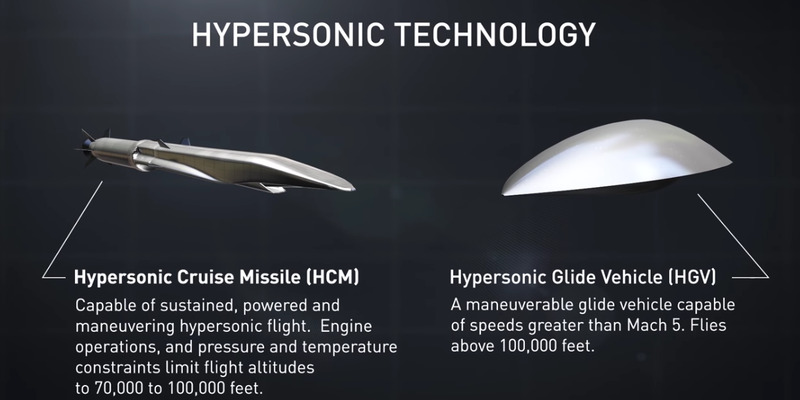 TheRANDCorporation/YouTubeA screenshot from a video from the RAND Corporation about hypersonic missile nonproliferation showing the two kinds of hypersonic weapons. More specifically, Hyten said that low-yield submarine-based nuclear weapons were the primary defence. Hyten added later in the hearing, responding to a question from Democratic Senator Bill Nelson, that the US needed to “pursue improved sensor capabilities” in order to “track, characterise, and attribute the threats wherever they come from.” Detection of ICBMs is mostly done through satellites orbiting the earth. The general acknowledged that there are still issues, primarily due to lack of resources and ageing equipment. “Right now we have a challenge with that, with our current on-orbit space architecture and our limited number of radars that we have around the world,” Hyten said. Hypersonic weapons can be destabilizing. HGVs and hypersonic cruise missiles can travel Mach 5 and above (340 miles every 6 minutes), can manoeuvre to avoid ICBM defences, and can impact a target just minutes after being detected. The RAND Corporation published a report that predicts that hypersonic weapons will be deployed to the battlefield in the next 10 years. At that point, the primary defence against ICBMs and nuclear missiles could no longer be kinetic or proximity interception of the missiles themselves, but the Cod War-era concept of mutual assured destruction.